The world you know no longer exists. There is no government. No army. No civilization. The United States has collapsed, and now thirty years after the war started, new powers finally try to take control over the ruined country, try to establish a new order, try to control others and create a new country, a new state: the 51st State. 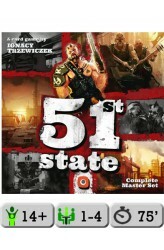 51st State is a card game in which players control one of four powers trying to build a new country. Players put new locations into play, hire leaders, and send people to work in buildings to gain resources and new skills. To do this, every card in 51st State can be used in three different ways: Raze a location to gain many resources once. Deal with this location to gain one resource every turn. Build the location so that.. In 51st State: Scavengers, nothing is lost forever — meaning that you can now search the discard for valuable locations and leverage them for use in your State. 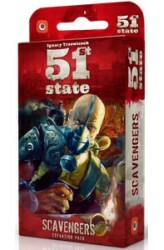 51st State: Scavengers, the first expansion for 51st State: Master Set, is based on the previous 51st State expansion Ruins. This set of fifty cards brings back some favorite cards from the original expansion while introducing new locations to the game as well as a new mechanism. 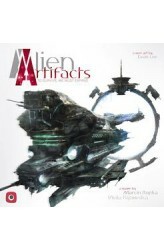 ..
Alien Artifacts is a 4X-style card game in which you play as an interplanetary faction, sending your research vessels into uncharted space to expand your knowledge and power. Build powerful ships, develop new technologies, and explore distant planets for anything — or anyone — you can exploit. Alien Artifacts is built on a Resource engine - each turn you will have 3 Resource cards in your hand and you will decide how best to spend them. Each resource card has two different resource types for you to use. You can only use one side and only two cards per turn! Using these resources, you will build Ships, develop Technology, discover Planets, or Trade for currency! New Ships allow you to attack the aliens and gain their valuable artifacts which provide huge bonuses. 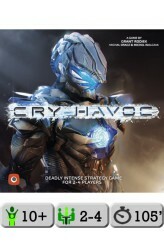 Wit..
Cry Havoc is a card-driven, asymmetric, area control war game set in a brutal, science fiction setting. Each player commands one of four unique factions with varying abilities and units. The game includes 54 custom miniatures, a large format board, and over one hundred unique cards, all with stunning new artwork. 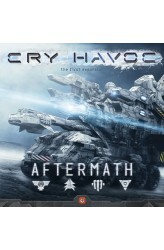 https://www.youtube.com/watch?v=qQyDzI4rTvs ..
Cry Havoc: Aftermath expands Cry Havoc with new skills and structures to add even more re-playability to the game. Each faction receives five new skills and three new structures, which nearly doubles the amount of unique abilities in the game. Additionally, this expansion introduces an alternate game mode that ensures each game lasts for five full rounds. When passing an event token, instead of removing it, new scoring abilities are introduced that allow players even more options to gain victory points. https://www.youtube.com/watch?v=gL50HmPThwM .. 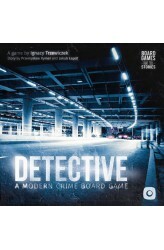 In Detective: A Modern Crime Board Game you are going to solve FIVE different cases and find out what connects them, you are going to BREAK THE 4th WALL by using every resource you can, you are going to browse the game's DEDICATED DATABASE simulating agency's resources, you will enter a city maze of old mysteries and fresh CRIME, and you will be able to COOPERATE with other agents or solve the mystery on your own. Take the job of a real detective in a modern setting! In Detective: A Modern Crime Board Game, 1-5 players take on the role of investigators, solving mysterious crimes while working as an Antares National Investigation Agency team members. This board game tell rich stories - stories you will participate in. Let's hope that you will be able to deduce the end,.. Solve one more case, an independent scenario called Suburbia. It will allow you to delve deep into the Cleveland suburbs and face corruption at its finest. Case 6 is a great way to familiarize yourself with the rules of the game and fully prepare yourself for the demanding campaign from the box. But it is also a perfect scenario for a one-off game session. It is a bit shorter and simpler than the other missions, thus we also recommend playing it with friends who are not convinced to devote more than 15 hours to the entire campaign. 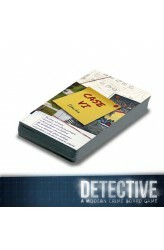 This is a standalone Case 6 for Detective: A Modern Crime Board Game, previously available only for those, who pre-ordered the game. 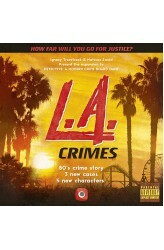 ..
Detective: L.A. Crimes, the first campaign expansion for Detective: A Modern Crime Board Game, consists of three separate cases that come together to form a full story. Travel to sunny California, and delve deep into the drug-filled Los Angeles of the 1980s. Experience being an L.A. detective, and realize that sometimes, like detective Foley from Beverly Hills Cop, you may need to stretch the laws a bit to suit your needs. Try some controversial methods to solve your case, all the while battling with the red tape of bureaucracy. Use all-new mechanisms of stakeout and observation to learn more about your suspects. The choices are yours, but are you willing to cross the line? .. 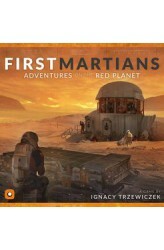 Built on the core of the award-winning Robinson Crusoe: Adventures on the Cursed Island, First Martians: Adventures on the Red Planet pits players against the hostile Martian environment and a whole host of new adventures and challenges. The immersion experience is further enhanced with an integrated app that maintains the balance and challenge throughout. Players have the option of taking on the design as a series of separate games, in a custom campaign mode in which each successive game builds on the last. 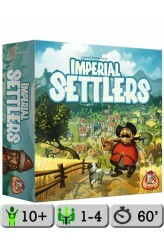 https://youtu.be/2DshQJW0wVw ..
Settlers from four major powers of the world have discovered new lands, with new resources and opportunities. Romans, Barbarians, Egyptians and Japanese all at once move there to expand the boundaries of their empires. They build new buildings to strengthen their economy, they found mines and fields to gather resources, and they build barracks and training grounds to train soldiers. 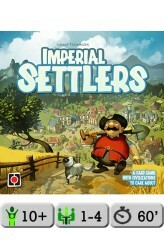 Soon after they discover that this land is far too small for everybody, then the war begins... Imperial Settlers is a card game that lets players lead one of the four factions and build empires by placing buildings, then sending workers to those buildings to acquire new resources and abilities. The game is played over five rounds during which players take various actions in order to explore new lands, bu..
Kolonisten van vier wereldmachten hebben een nieuw gebied ontdekt met een rijkdom aan grondstoffen en rijkdommen. De Romeinen, Barbaren, Egyptenaren en Japanners trekken tegelijkertijd dit gebied in om de grenzen van hun rijk te verleggen. Ze bouwen nieuwe gebouwen om zo hun economie te verbeteren, graven mijnen uit en leggen akkers aan om grondstoffen te vergaren en bouwen kazernes om soldaten te trainen die de grenzen moeten bewaken. Maar al snel komen ze erachter dat het gebied veel te klein is voor iedereen... Bouw je eigen wereldrijk:Kies één van de vier volkeren en bouw een wereldrijk. Elk volk heeft zijn eigen speciale eigenschappen en vaardigheden, waardoor elk volk anders is om te spelen! 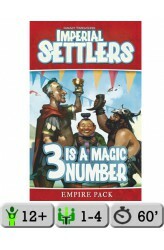 Ongekend veel mogelijkheden: De enorme hoeveelheid kaarten maakt verschilllende ..
Imperial Settlers: 3 Is a Magic Number, the second Empire Pack for Imperial Settlers, introduces a new rule: SET. This new ability allows players to score and trigger new effects each time they build three cards in a particular color. With this rule, the drafting phase and the choice of the "right" card to draft becomes even more interesting. This expansion includes new cards for the common deck as well as new cards for each of the five factions and two cards for use in the solitaire game. ..